With the festive season upon us, it is time to adorn our homes with our favourite decorations. Why not add to your decoration collection this year with a beautiful, unique ornament made by your own fair hands? 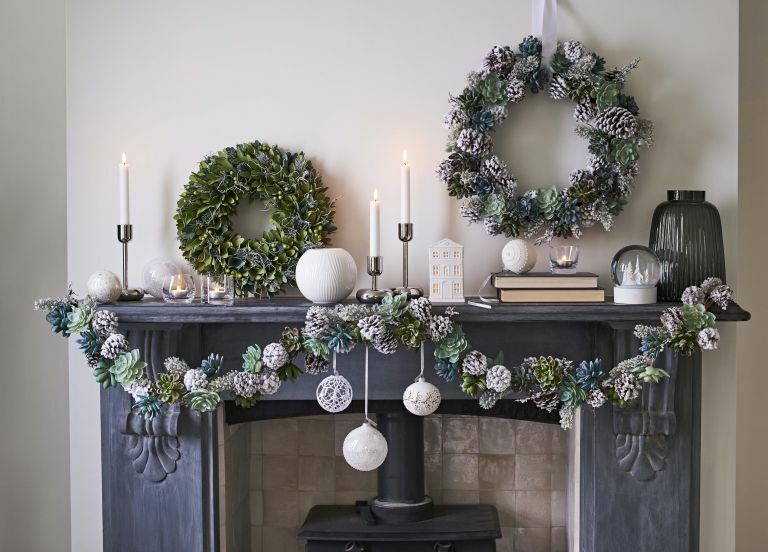 In the step-by-steps below, learn how to make a button bauble, upcycle baubles with paint, create a beautiful Christmas wreath to hang on your front door, a mini Christmas tree out of ribbons, tealight holder, a topiary tree, personalised placemats and a table decoration. See how to make a stylish and festive bauble that will look great hanging on your Christmas tree or around the home. We used old buttons in this craft which takes just minutes. If you have changed your decorating scheme since last Christmas, or just have baubles lying around that don't match, you will be pleased to know you can easily upcycle Christmas decorations to give them a new look. This pretty marble effect is bang on trend and can be finished in minutes with the help of a couple of cans of spray paint. You can use any seasonal foliage for your wreath. Add colour with berries and oranges, and texture with a few pine cones. 1. Bind generous handfuls of moss on to the wire wreath frame with missing wire. To do this, fasten one end of the reel of the wire to the ring and wrap around the moss in a circular fashion, keeping it taut, and adding handfuls of moss until well covered. 2. Add seasonal foliage (Georgia used Eucalyptus cinerea and Skimmia japonica, but you can use holly or other greenery), by pushing the ends deep into the moss base, working to roughly a 45 degree angle. Use a variety of materials to create an interesting and textured wreath; Georgia added crap apples for colour and rosemary for scent and texture. Whether you need something to up your table setting game, or a few tealight holders to safely give a hearth a candlelit glow, these mercury effect jars will do the trick. They are so easy and this is a great way to make old jam jars a little bit more festive. You only need a twig, spool, ribbon and some PVA glue to make this small decoration. Pop it on a shelf, or make a whole forest to style up your windowsills. You can make beautiful and unique decorations with items that you find outside with this simple how-to from Crown Paint. From branches to pine cones, holly leaves and conkers, collect items from the great outdoors and give them a bit of sparkle with some metallic paint. They are a great addition to your Christmas tree or can be attached to a homemade wreath or garland. 1. Make sure anything you collect to paint is free from dirt and nice and dry. 2. Tie a ribbon around the stalk if painting a leaf or secure wire around the top of pine cones – you will hold this for dipping. 3. Dip the item into the paint and hang somewhere to dry. Georgia Miles, owner of The Sussex Flower School, teaches the art of floristry from her village studio. Here, she shares the process of one of her favourite seasonal makes. 1. Prepare your pot by setting your branch in the pot with fast set post mix. Attach wet oasis ball to the top of your trunk using floral tape. 2. Snip foliage to desired length; Georgia used skimmia japonica, but you can use other seasonal greenery. Add foliage to ball in a ‘Mohican’ shape until you have a generous, but not crowded base. 3. Cut rose stems to size and insert into base. You want an even spread, but don’t use too many. 4. Add seasonal berries. Georgia used viburnum tinus berries to add contrast to the roses. 5. Finish by securing a ribbon right at the top of the trunk. Trim ends with points. 6. For evening use, discreetly wrap around battery-operated fairy lights. If your placemats are letting your Christmas table setting down why not upcycle them before rushing out to buy more? Painting them with chalkboard paint will give them a fresh new look and they can be used for placenames so your guests know where they are sitting. Make your own centrepiece, showcasing your favourite flowers by following this design. It is surprisingly easy to make, and with its moist foam base, it should last for several days. 1. Wet your foam base and bind into the container with pot tape. 2. Create an outline with foliage and twigs, trimming as your go. 3. Insert the candle and reinforce it by taping on wooden sticks for stability. 4. Keep the design rectangular using a variety of textures. 5. Group the roses in the centre for focus. You may need wire to fix the crab apples. 6. Fill any gaps then check your centrepiece from all angles.